03 October 2015 – The Philippines reaffirmed its steadfast commitment to the rule of law and sustainable development through key priority areas in the United Nations. 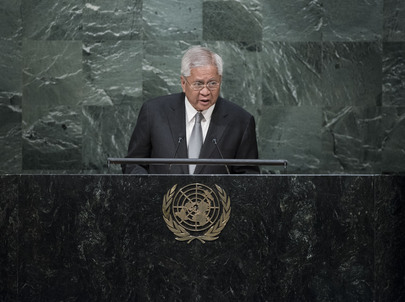 In his address before the 70th Session of the UN General Assembly (UNGA) today, Philippine Foreign Affairs Secretary Albert F. Del Rosario identified key priority issues such as climate change; the rule of law; disarmament and non-proliferation; women, peace and security; migration and human trafficking, peacekeeping; and UN reform. “With all the successes and challenges, praises and pitfalls, the United Nations has not only demonstrated its resilience, but has also affirmed continuing relevance against the backdrop of complex global issues and emerging regional threats to peace and security,” he said. Secretary Del Rosario led the Philippine Delegation to the 70th Session the UNGA which has the theme, “The United Nations at 70: The Road Ahead for Peace, Security and Human Rights”. He said that the theme echoes the fundamental elements that led to the creation of the United Nations and is also at the core of Philippine President Benigno S. Aquino III’s Social Contract with the Filipino People. On the 2030 Agenda for Sustainable Development, the Philippine Foreign Minister said the Philippines outlined five pillars which form part of the building blocks for the new framework. These include poverty reduction and social inclusion; environment sustainability, climate change and disaster risk management; accountable, responsive and participatory governance; a fair and stable order based on the rule of law; and peace and security. Secretary Del Rosario also stressed that the Philippines will continue to play an active role in tackling the issues of climate change, resiliency and disaster risk reduction and management (DRRM). The Philippines is currently the President of the Climate Vulnerable Forum (CVF) and intends to promote a meaningful outcome in the UN Framework Convention on Climate Change 21st session of the Conference of Parties (COP21) in Paris. “The international community must adopt a new legally-binding climate agreement that is universal and equitable, one that ensures a bright and low-carbon future for the next generation; and one that addresses the needs of vulnerable states and sectors particularly the poor, women, migrants and indigenous peoples,” the Secretary explained. On the maritime disputes in the South China Sea, Secretary Del Rosario said the Philippines has long placed its faith in the rules and institutions that the international community has created to regulate relations among States. He added that with the growing support from the international community in peacefully resolving disputes in the South China Sea, including through arbitration, the Philippines believes that the final outcome of the arbitration process would pave the way for a settlement of the maritime disputes. “On our dispute with China, a long-time partner and neighbor, we also hope that we will finally see actions that are consistent with Beijing’s declarations so that genuine efforts to lower tensions in the South China Sea can succeed and the peaceful settlement of disputes can be obtained,” he said. As host of the Asia-Pacific Economic Cooperation (APEC) in 2015, Secretary Del Rosario shared with the World Body that the Philippines will pursue the following priorities: investing in human capital development; fostering Small and Medium Enterprises’ participation in regional and global markets; building sustainable and resilient communities; and enhancing the regional economic integration agenda. Secretary Del Rosario also highlighted that the partnership between the Association of Southeast Asian Nations (ASEAN) and the UN has been beneficial to regional peace and stability. In the negotiations on the 2030 Agenda for Sustainable Development, he added that the Philippines emphasized, and will continue to highlight, the positive contributions of migrants to sustainable development in countries of origin, transit and destination. “We deeply appreciate the UN’s recognition of the Philippines as a model of migration governance because of its comprehensiveness in terms of managed deployment, solid protection component, diaspora engagement and re-integration. Both the UN and the Philippines believe that migration governance is really about giving migrants a “human face,” he said. On peacekeeping, he said the Philippines will continue to engage with the UN’s Department of Peacekeeping Operations in the deployment of Filipino peacekeepers and support the recommendations of the High-Level Independent Panel on UN Peace Operations to improve the safety and security of our peacekeepers. On UN reform, Secretary Del Rosario said the Philippines will continue to push for meaningful discussions on enhancing the role and authority of the UNGA, as well as on proposals to rationalize the agenda of the Assembly and its Main Committees.